This is my most favorite meal ever. I make it when I cook a red meat dish for my family. My husband calls it glorified spaghetti sauce and doesn’t touch it…more for me I say! I usually have it with a fresh crusty bun. This recipe was taken from The New Moosewood Cookbook by Mollie Katzen. 1. Heat olive oil in a deep skillet or Dutch oven. Add garlic, onion, and bay leaf, and saute over medium heat for about 5 minutes. 2. Add eggplant, salt, and herbs, and stir. Cover and cook over medium heat, stirring occasionally, for 15 to 20 minutes, or until the eggplant is soft. 3. Add zucchini, bell peppers, black pepper, and tomatoes. (Break the tomatoes into smaller pieces with a spoon). Cover and simmer for about 10 more minutes, or until the zucchini and bell peppers are tender. 4. Serve hot, warm, or at room temperature – plain, or topped with parsley and/or olives. This is my favorite pizza. It takes some work to make but it is well worth it. The recipe asks to cut the dough in 8 pieces, i just make 2 pizzas on the BBQ. You would think the dough would fall through the grates of the BBQ, but it doesn’t. The crust turns out perfect every time. 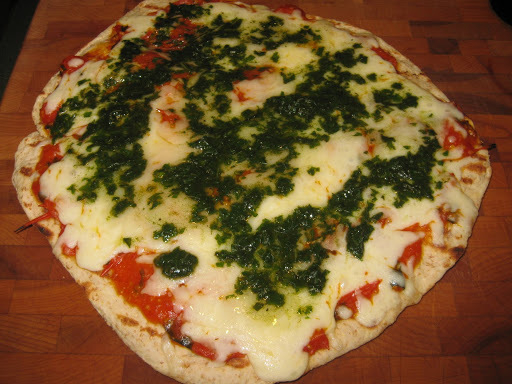 I highly recommend that you make this pizza with the basil drizzle, but I have made it without and the pizza is still good. I use my Kitchen Aid mixer with the dough attachment to make the crust. This recipe was taken from The Best of HeartSmart Cooking by Bonnie Stern. 1. To prepare crust, in a large bowl, combine warm water and sugar . Sprinkle with yeast and let stand for 10 minutes, or until yeast bubbles up. 2. Stir in all-purpose flour, whole wheat flour, cornmeal, salt and 1 tbsp oil. (This can be done by hand or in a food processor.) If necessary, add more all-purpose flour until dough is still very soft but does not stick to your fingers or counter. 3. Knead dough for 5 to 8 minutes, form into a ball and place in a large bowl with remaining 1 tbsp oil. Roll dough in oil, cover and let rise for 1 to 1 1/2 hours, or until dough doubles in volume. 4. Meanwhile, to prepare topping, in a food processor, puree basil, oil and salt. 5. Punch dough down and cut into 8 pieces. Roll out or stretch each piece of dough until very thin (about 6 inches/15 cm in diameter.) Do not worry if pieces are oddly shaped. Spray with non-stick cooking spray or brush with a little olive oil. 6. Place dough on a hot grill and grill for 1 to 2 minutes per side. Reduce heat to low. 7. Top pizzas with tomato sauce and mozzarella, close lid and cook for about 5 minutes, or until cheese bubbles and crust is crispy on bottom (check occasionally to make sure bottom is not browning too much.) You can also transfer grilled dough to a baking sheet, add toppings and bake in a preheated 400F oven for 10 minutes. This is another one of my 10 ten favorite meals. You can make this ahead of time. Cover with plastic wrap and put them in the fridge until dinner time. My husband doesn’t like feta, so I make his with mozzarella or havarti cheese. I also just barbeque the chicken instead of sauteing it. This recipe was taken from The Complete Light Kitchen by Rose Reisman. 1. 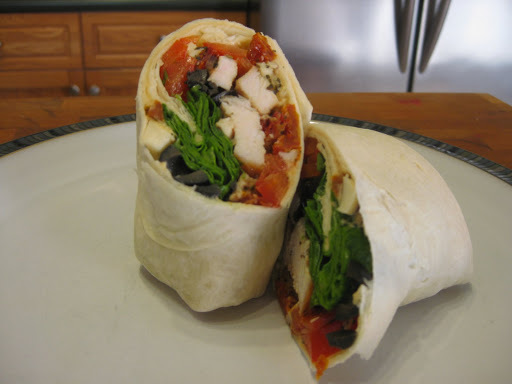 Working with one at a time, pound the chicken breasts to an even 1/2 inch thickness between two sheets of waxed paper. 3. Stir the green and red pepper, onion, feta, tomatoes, olives, oil, basil and garlic together in a large bowl. 4. Spread the hummus over the entire surface of the tortillas. Place the vegetable mixture over the hummus. Scatter the spinach leaves overtop and add the chicken. Roll the bottom of each tortilla up and over the filling, fold in both sides, and continue to roll up tightly. Cut each roll in half before serving. This recipe is so easy and super yummy. It is taken from the cookbook Cooking with WOW! 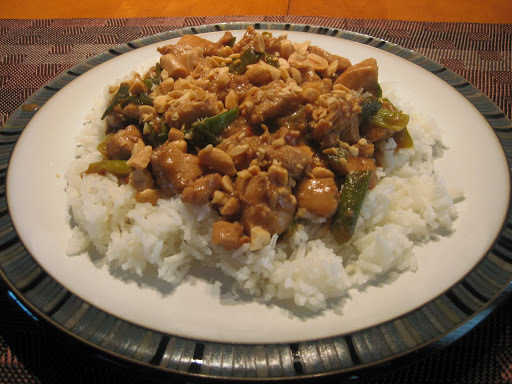 This recipe is taken from the restaurant Hu’s on First. 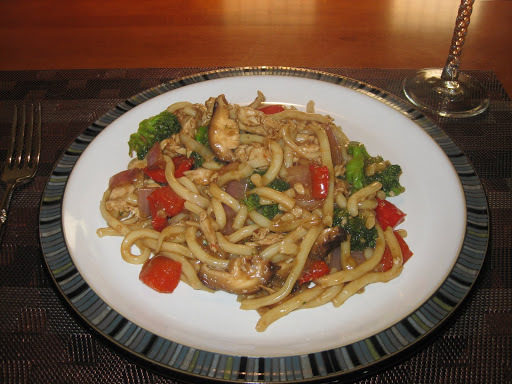 In a bowl, combine soy sauce, hoisin sauce, oyster sauce and chicken stock. Set aside. 1. In a wok, over high heat, add sesame oil, then add meat, cook until brown. Remove meat from wok and set aside. Add vegetables, ginger and garlic to hot wok for 1-2 minutes, add water to steam broccoli. Cook out water. Add meat and sauce to wok, bring to a boil, then add noodles. In a bowl, combine cornstarch and water to create a slurry, add to boiling sauce 1 tablespoon at a time to achieve desired thickness. !. In a large mixing bowl beat butter with an electric mixer on medium to high for 30 seconds. Add brown sugar, sugar, and baking soda. Beat until mixture is combined, scraping sides of bowl occasionally. Beat in eggs and vanilla until combined. Beat in as much of the flour as you can with the mixer. Stir in any remaining flour. Stir in the chocolate chips. 2. Drop dough by rounded teaspoons 2 inches apart onto an ungreased cookie sheet. Bake in a 375 F oven for 8 to 10 minutes or until edges are lightly browned. Transfer to a wire rack and let cool. This is another one of my favorite recipes. It’s easy to make and super yummy. This recipe was taken from Food & Wine Magazine’s Quick from Scratch Chicken Cookbook. Instead of peanuts you can always use cashews. I don’t stir-fry them like the recipe calls for as I just add them chopped up on top. 1. In a medium bowl, toss the chicken with 1 tablespoon of the soy sauce, 1 tablespoon of the sherry, and the 1 tablespoon cornstarch. 2. In a small bowl, combine the sugar, vinegar, sesame oil, water, and the remaining 4 tablespoons of soy sauce, 1 tablespoon of sherry, and 2 teaspoons cornstarch. 3. In a wok or large frying pan, heat 1 tablespoon of the oil over moderately high heat. Add the peanuts and stir-fry until light brown, about 30 seconds. Remove from the pan. Heat the remaining 1 tablespoon oil. Add the white part of the scallions and the red-pepper flakes to the pan and cook, stirring, for 30 seconds. Add the chicken with its marinade and cook, stirring, until almost done, 1 to 2 minutes. Add the soy-sauce mixture and the scallion tops and simmer until the chicken is just done, about 1 minute longer. Stir in the peanuts. !. Preheat oven to 375F. 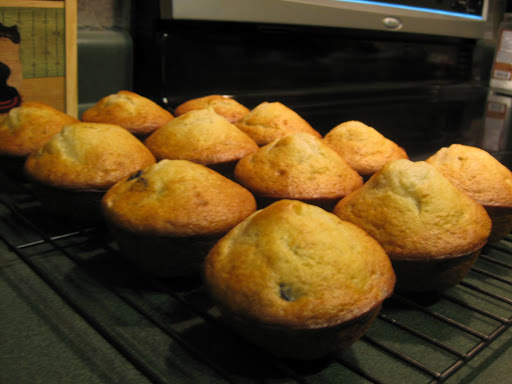 Spray 12 muffin cups with vegetable oil. 2. Using an electric mixer, beat together bananas, sugar, oil, egg and vanilla in a large mixing bowl until well mixed. 3. In another bowl, combine flour, baking powder and baking soda. Stir the banana and flour mixture together. Stir in the yogurt. Fold in the chocolate chips. 4. Divide the batter among the prepared muffin cups and bake in centre of oven for 15 minutes and a tester inserted in the middle of the muffin comes out clean. Turn out and serve immediately. 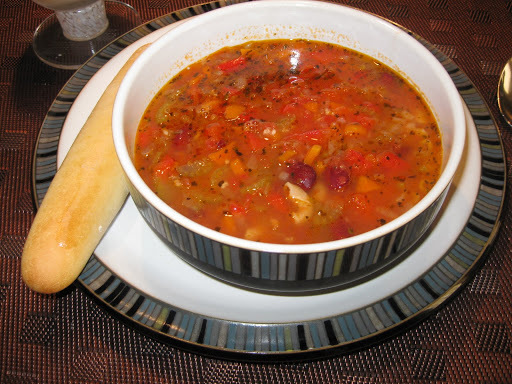 This is a quick and easy soup to make. In the picture I didn’t add the zucchini like I usually do as the grocery store didn’t have it that day. This recipe is taken from The New Moosewood Cookbook by Mollie Katzen. 1. Heat the olive oil in a dutch oven. Add onion, garlic, and 1 1/2 tsp salt. Saute over medium heat for about 5 minutes, then add celery, carrot, oregano, black pepper, and basil. Cover and cook over very low heat about 10 more minutes, stirring occasionally. 2. 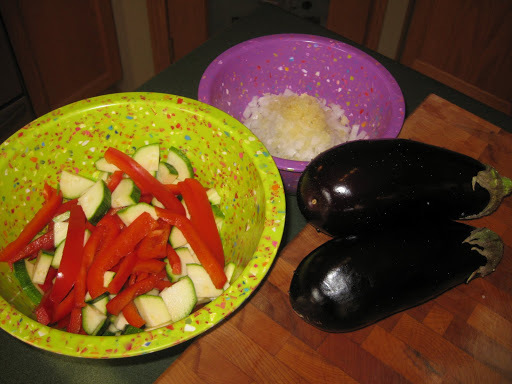 Add bell pepper, zucchini, water, and tomato puree. Cover and simmer about 15 minutes. Add beans and simmer another 5 minutes. 3. Bring the soup to a gentle boil. Add pasta, stir, and cook until the pasta is tender. Serve right away topped with Parmesan cheese. This is a family favorite! 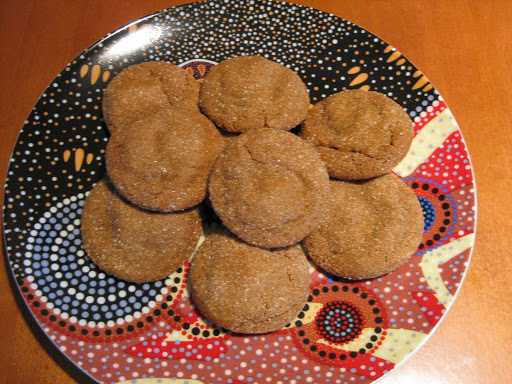 The recipe was taken from the August 2010 edition of Canadian Living magazine. 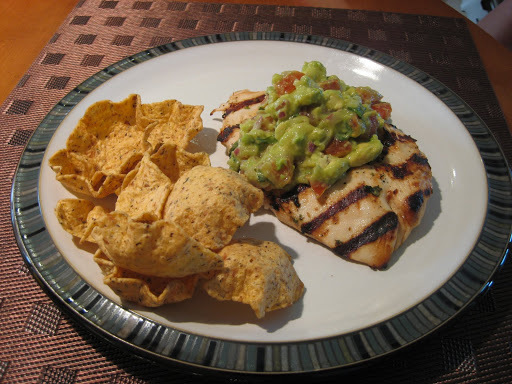 I use 2 avocados instead of one and 4 tomatoes instead of 2, as the salsa is in high demand! Cut chicken breasts in half to create 8 pieces. Pound each to even thickness. In glass bowl, combine 1/4 cup (60 ml) of the lime juice, 3 tbsp(45ml) of the cilantro, 2 tbsp(30ml) of the olive oil, garlic and half each of the salt and pepper. Add chicken, tossing to coat. Cover and refrigerate for 30 minutes. Meanwhile, combine tomatoes, onion, jalapeno peppers, vinegar and remaining lime juice, cilantro, oil, salt and pepper. Peel and cut avocado into large dice; gently toss with salsa, without breaking up. Set aside. Place chicken on greased grill over medium-high heat; close lid and grill until no longer pink inside, about 3 minutes per side. Serve with salsa. When I visit my friends who have kids. I often bring this cookie with me since it’s always a hit. 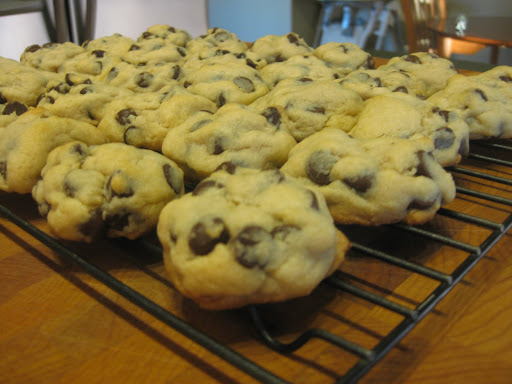 This recipe makes a lot of cookies so I often have my kids help me make them. They love rolling the uncooked balls into the sugar. This recipe was taken from Better Homes and Gardens New Cookbook. !. In a small bowl stir together flour, ginger, baking soda, cinnamon, cloves and salt; set aside. In a large mixing bowl beat butter with an electric mixer on low speed for 30-seconds. Add the 2 cups sugar. Beat until combined, scraping sides of bowl occasionally. Beat in eggs and molasses until combined. Beat in as much of the flour mixture as you can with the mixer. Stir in any remaining flour mixture. 2. 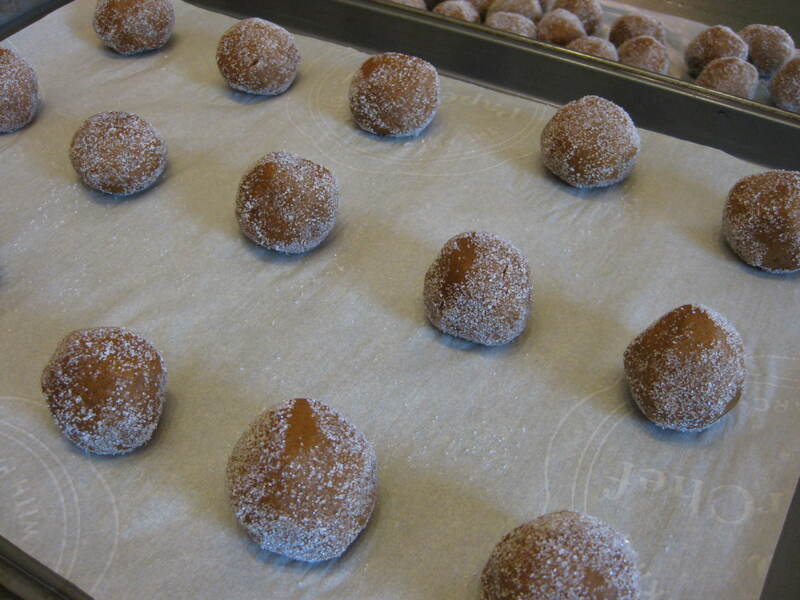 Shape dough into 1-inch balls; roll in sugar. Place 1 1/2 inches apart on an ungreased cookie sheet. 3. Bake in a 350F oven for 8 to 9 minutes or until bottoms are slightly browned and the tops are puffed(do not overbake). Cool on a cookie sheet for 1 minute. Transfer to a wire rack and let cool. Makes about 120 cookies.